4 years ago, Laura was working as a paralegal. She didn't enjoy it, so quit her job to start her own business. She used her honed email writing skills to build a business helping KISSmetrics, CrazyEgg, Copy Hackers, Get Response, and Mailshake. One client had 33% uplift in positive replies. You will need to put in some hard work, but cold emails work surprisingly well if you nail clarity, micro-yes's, and limiting your emails to a single goal. This is a great example of a cold email to Leslie Nope. It's clear, has Leslie nodding along while reading, and has a single request: set up a 15-minute phone call with me. A confused mind doesn't buy! Any sort of doubt builds another roadblock to "yes." Start making your cold emails clear with a subject line that specifically states the purpose of your email. 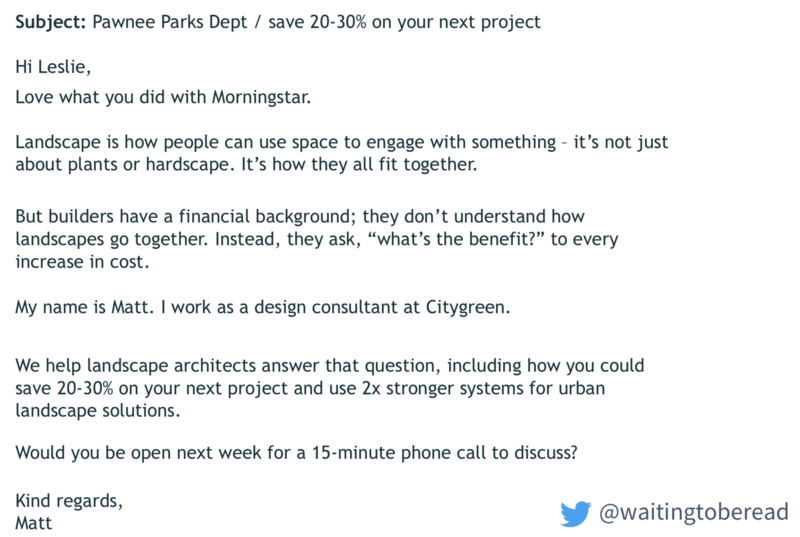 If you were emailing Leslie Nope of Parks and Recreation, you might have a subject of "Pawnee Parks Dept. / save 20-30% on your next project". It also helps to start with a compliment, like "love what you did with Morningstar." A clear cold email sent to Laura, except for the "meaty, double-stuffed chalupa" bit - is he inviting Laura to lunch?. 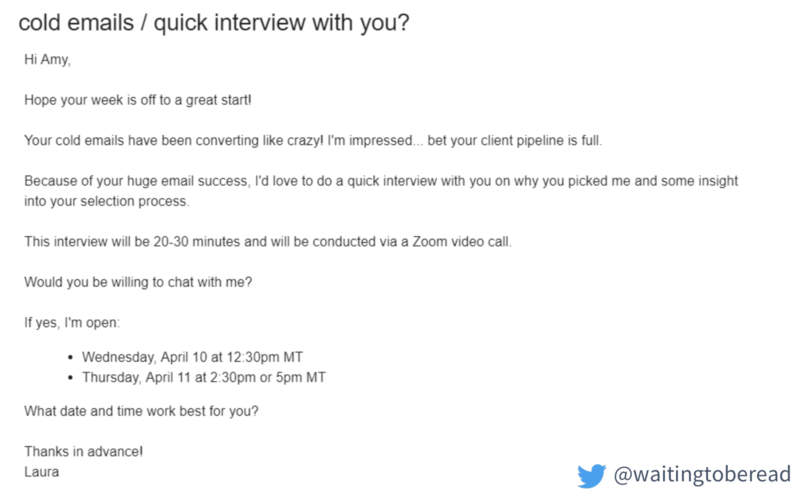 This cold email to Laura compliments her, has built-in micro yes's built into each line, and has a clear request. Every email needs one (and only one) goal. This example cold email has two questions, but the answer to the first question is an assumed "yes." Is it too aggressive to suggest dates and times you're available? Not as aggressive as a calendly link, and emails with suggested times convert. Isn't "would" not aggressive enough? 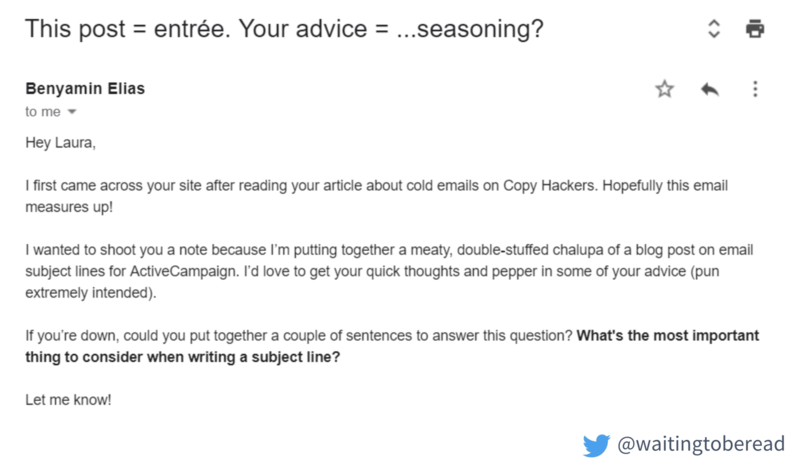 How much do you personalize cold emails? I'm using Mailshake fed off a personalization column. Personalization will always convert better. If you feel like you're using too much time on it, use a Virtual Assistant (VA). Your genius doesn't lie in personalizing email work. 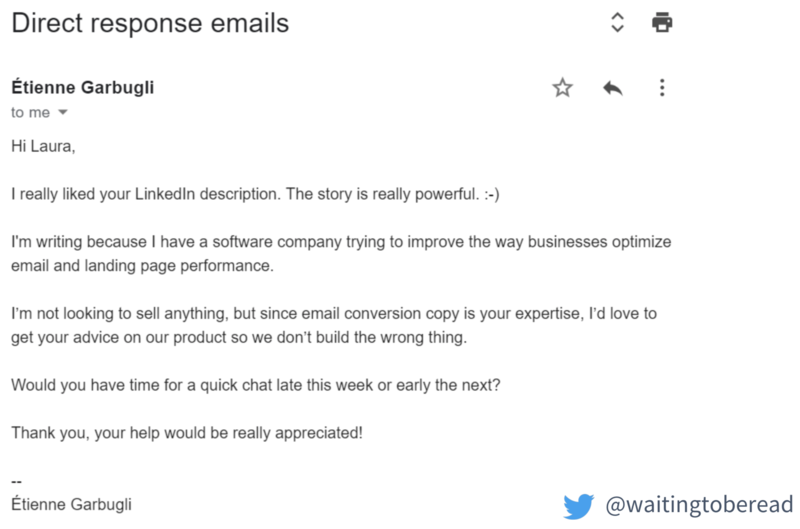 If nobody's doing the action you want them to take with shorter emails, maybe they need longer emails to understand what you're offering and have enough reasons to say yes. Experiment!